Pour chicken broth into a large saucepan, and bring to a boil. Boil until reduced by about 1/3. Pour in both cans of the tomatoes, and return to a simmer. Pour in the half-and-half, and turn heat to low. Simmer for 15 minutes. Puree in batches in a blender, or use an immersion blender in the pan. Season with salt and pepper to taste. Ladle into bowls, and swirl in a spoonful of pesto before serving. 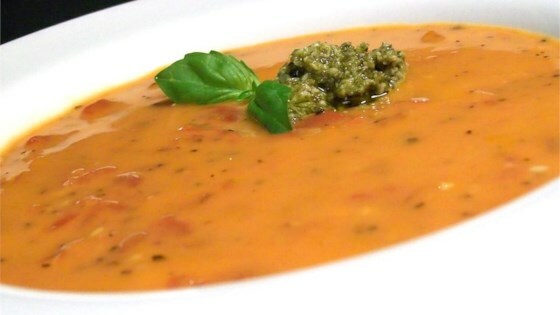 Great Creamy Tomato Soup Recipe. Just what I was looking for... I added some Garlic Pepper to it to give it a little more taste and used Whipping Cream instead to make it richer. Very easy to prepare and tasty. I used fat-free half & half in this recipe and it came out great. I did not add the pesto. I will make this again for guests.